COMPANY & CHEERS: Some Wildcard Wednesday Treats | THAT'S ENTERTAINMENT! Welcome to another Wildcard Wednesday! In today’s post, I’m sharing some treats in relation to Company (1970), one of my favorite musicals, and Cheers (1982-1993, NBC), one of my favorite sitcoms! Here’s an audio of the original cast about a week into their original Broadway opening. This is Dean Jones with Bobby’s “Being Alive” and the original cast with the final scene as performed on May 2nd, 1970. By the end of the year, Russell was replaced by Vivian Blaine. Here’s a live audio of her rendition of the same number. This rare 12-minute “mini-sode” was produced in 1983 during the first season by the United States Department of Treasury to promote U.S. savings bonds. Not a laugh riot, but fascinating nonetheless! And finally, here’s a fake alternate ending to the fifth season finale in which Sam and Diane decide to go through with their wedding and actually tie-the-knot. Come back next Wednesday for another Wildcard post! And tune in tomorrow for more Xena! RIP, Pete Axthelm. I still remember seeing him on NBC making lots of snide comments about various games between lousy teams, including the “Bay of Pigs” between Green & Tampa Bays. SB XVII was played when I was XVII myself and a senior in high school, but I didn’t become much of a sports fan until I was in college, so the SB was the only football game I watched each year. Cheers premiered in the genesis of NBC’s “Must See TV” Thursday nights along with Family Ties. I remember how hacked off my sister was when I told her NBC was moving Gimme a Break to Thursday night and messing up “the best night of television on television”. It didn’t stay there long though. I actually watched Supertrain a couple times when it was on NBC. That would be something you could cover if you ever have want to have some fun and write about tv’s biggest flops. Hi, Jon! Thanks for reading and commenting. No plans to cover SUPERTRAIN (or any vintage TV dramas, really), but there will be plenty of flop/forgotten sitcoms both in the near and distant future! I found this site by chance and I came across these rare recordings of “Company” that certainly is my favorite musical! I am grateful for you sharing these rarities! Thank you so much! Did you have more of these recordings? My favorite songs are “Not getting maried today” and “You could drive a person crazy” … You have the live version? Hi, Jônatas. Thanks for reading and commenting! So great to hear recordings of Company live, thanks for posting. Please post more recordings of Company live performances with Dean jones in 1970 if possible. It would be really interesting to hear the original cast’s interpretation of the script. Hi, Tharan. Thanks for reading and commenting! I have no plans to post any more from COMPANY and am unlikely to do so. If you’re interested in obtaining the Jones OBC audio in full, subscribe to this blog and I will be happy to send it your way via email. Got it… Thanks so much! Love, love, love the recordings from “Company”! Thanks so much for posting them. 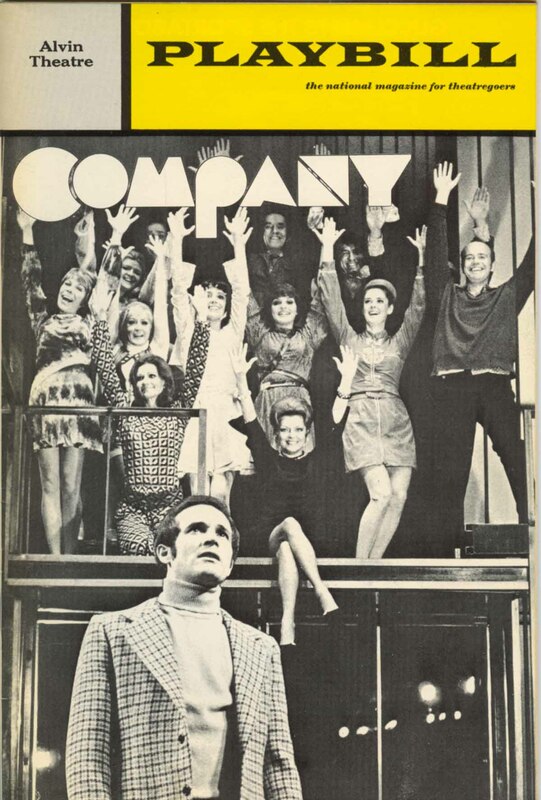 “Company” was my first Broadway experience, back in 1970. What a thrill. Hi, Peggy! Thanks for reading and commenting.